Persistent low metals prices in recent years have crushed many explorers and turned a lot of them into “basket cases” where at best they limp along just paying their bills and are often heavily in debt. 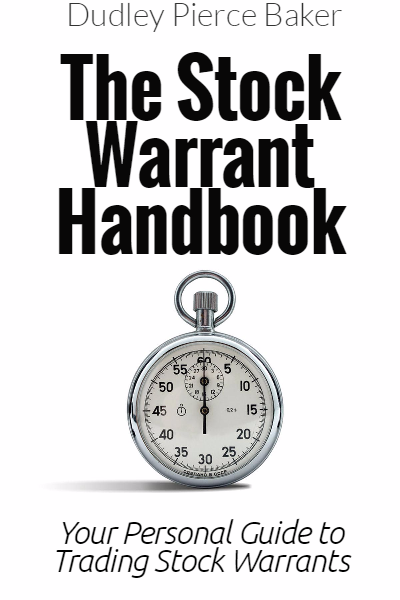 This seems to have been the case with Quaterra Resources Inc. (QTA:TSX.V; QTRRF:OTCQX) where in the rare event of a new employee being taken on, he would be handed an unsigned (because the author is no longer around to sign it) copy of Charles Dickens’ “Hard Times” on induction day, just to get him into the right frame of mind. With Quaterra, based on its having a range of copper projects and the copper price and its stock price being moribund for many months, it has been easy to jump to the conclusion that it could go “belly up” at any time, but this overlooks the fact that the company is in possession of valuable water rights that are much in demand, and in fact the value of the company’s water rights greatly exceeds the company’s market valuation, which should mean that either the stock price will improve or it will get bought up. There has been a positive development with respect to this which is that the company has already sold some of its water rights and should be in receipt of the proceeds soon, which means that it is solvent and can if it wishes proceed to advance its projects. If I walked up to you and said “Excuse me, would you mind if I give you a $100 bill in exchange for a $20,” you would probably look at me as if I was nuts, and then, after holding the $100 up to the light and checking out the watermark etc, agree to the exchange. This is similar to the situation we have now in Quaterra Resources where we have a company worth 49 cents a share—and don’t take it from me, that’s Fundamental Research Corp’s fair value estimate—selling at about US$0.06 cents a share. Alright, some things could theoretically go wrong—the check that the company is due for its recent sale of water rights or land with water rights for $6.23 million could bounce, Al Qaeda could poison their remaining water etc, but what are the chances of these things happening? – they are minuscule, and viewed rationally, the current valuation of Quaterra is just plain nuts. Let’s just consider some of these numbers briefly, because there is no need for us to get bogged down in needless detail. At the current stock price (8 cents) the company is valued at about $12 million, they have a check due for $6.23 million for a recent sale of water rights, extrapolating from which their remaining water rights can be fairly valued at $20 million, their copper projects are estimated to be worth a very substantial sum, so adding all this up, we have the company valued by the market at $12 million, while its assets have a total value in excess of $100 million, and that’s without taking into consideration that other mining companies surrounding their properties might want to buy them up, and without taking into account that the copper price could rise a lot from its current low level in the midst of a commodities bull market. So this is what is known in the trade as a “no brainer.” It was market analyst Joseph Granville who said many years ago that “There is more maintained stupidity in this business than in probably any other business in the world”—how right he was—and is—and this undervaluation of Quaterra Resources is a classic example of it. You can almost hear the cogs and wheels turning in some investor’s brains as they slowly put 2 and 2 together to realize that due to these water rights, Quaterra is very undervalued here, and can either sell the water rights to advance it projects, hopefully as metals prices improve, or sit back and wait to be bought up by some larger company wanting to get its hands on its assets (so to speak). Let’s now proceed to see what the charts are saying about it. We’ll start with the long-term chart which looks positively Dickensian in that Quaterra is now so cheap it clearly has to “make do and mend.” Whilst it would be hopelessly unrealistic to expect the stock to ever approach its highs again, it is clear that even if it only advanced partway towards them it would result in substantial percentage gains from the current dismally low price, and that is possible since the price is—and has been since late 2014—tracking sideways marking out a potential low Pan base. Volume indicators are positive, which increases the chances of a new bullmarket getting going. On the 5-year chart we can examine this potential base pattern in much more detail. This chart opens it out and on it we can see that the price has been fluctuating in a range broadly bounded by about 15 cents on the upside and 4 or 5 cents on the downside. It has been down near to the support at the bottom of this range for a year now marking out another cyclical intermediate base, which positive volume indicators suggest is going to lead at least to another run at the upper boundary of the range and it broke higher and ran at the resistance level in the 9 cent area on January 25 and looks set to break above this level in due course, a development made much more likely by the fact that more investors are cottoning on to how undervalued this company is. Finally, the 6-month chart enables us to see recent action in detail; in particular Jan. 25th’s break higher on increased volume. Observe how the groundwork for this breakout was actually done during December when increased buying pressure soaked up much of the remaining available supply at the very low price prevailing then. Near-term it looks like the price will consolidate at the resistance at this level, perhaps backing off some, before proceeding to break above it, since the company will soon be in receipt of considerable funds from its sale of some of its water rights. 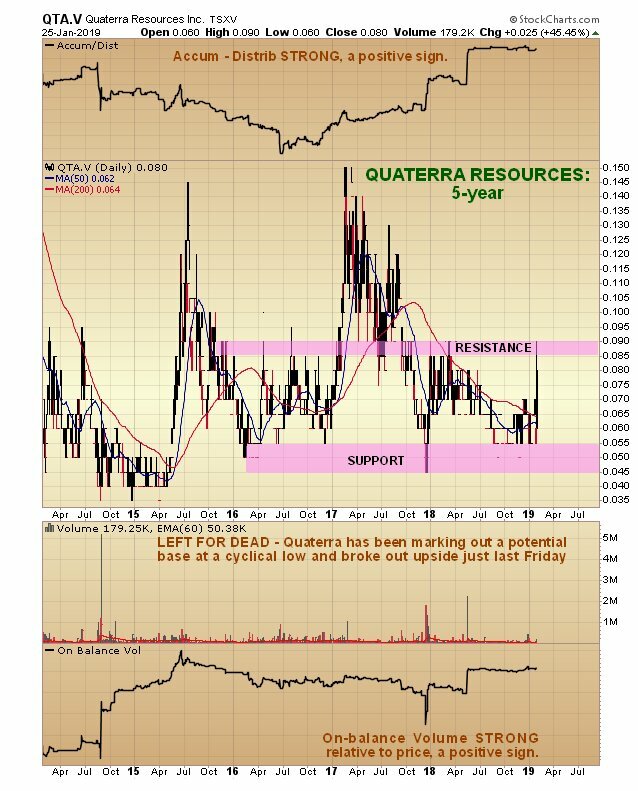 The conclusion is that, while Quaterra is not suited to all investors on account of its being a very low priced speculative play, it looks attractive here for those subscribers who are comfortable with holding or trading this type of stock. Quaterra trades on the US OTC market in light but acceptable volumes. One anomaly requires explaining. As there are 204 million shares in issue (257 million fully diluted), you would expect to see heavier trading in the stock, yet it seems to be thinly traded. The reason for this is that many of the bigger holders of its stock are long-time shareholders who hold large blocks of stock and are not minded to sell, so in effect it is tightly held. 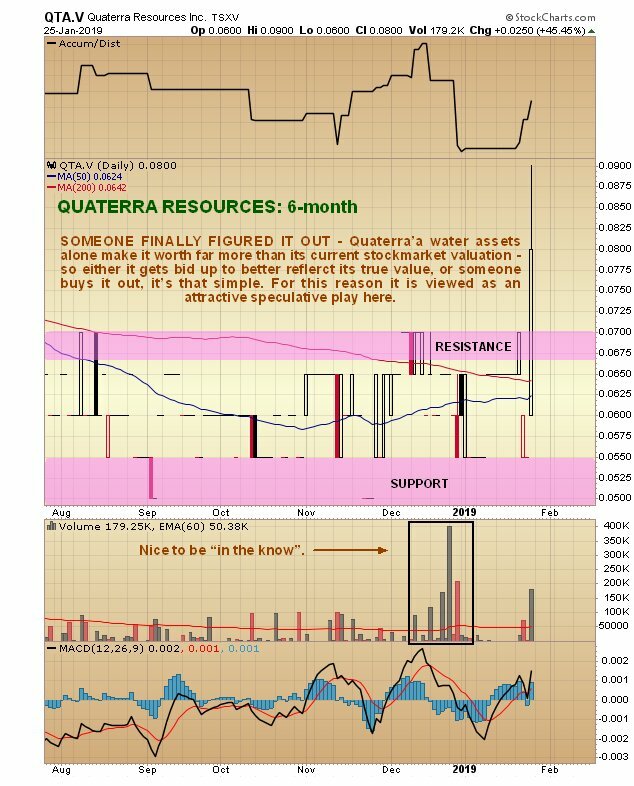 Quaterra Resources Inc, QTA.V, QTRRF on OTC, trading at C$0.08, $0.06 at 12 noon on 28th January 2019. 2) The following companies mentioned in this article are billboard sponsors of Streetwise Reports: Quatera Resources. Click here for important disclosures about sponsor fees. 5) From time to time, Streetwise Reports LLC and its directors, officers, employees or members of their families, as well as persons interviewed for articles and interviews on the site, may have a long or short position in securities mentioned. Directors, officers, employees or members of their immediate families are prohibited from making purchases and/or sales of those securities in the open market or otherwise from the time of the interview or the decision to write an article until three business days after the publication of the interview or article. The foregoing prohibition does not apply to articles that in substance only restate previously published company releases. As of the date of this article, officers and/or employees of Streetwise Reports LLC (including members of their household) own securities of Quaterra Resources, a company mentioned in this article.